The Intersections & Beyond: Cine Lokal highlights Pride and Love in "4 DAYS"
Cine Lokal highlights Pride and Love in "4 DAYS"
Cine Lokal continues its offering on all kinds of love this month of February with 4 Days, an LGBT romantic drama directed by award-winning film director Adolf Alix Jr., featuring Mikoy Morales and Sebastian Castro. Will you stay inside a relationship that keeps you from being proud? 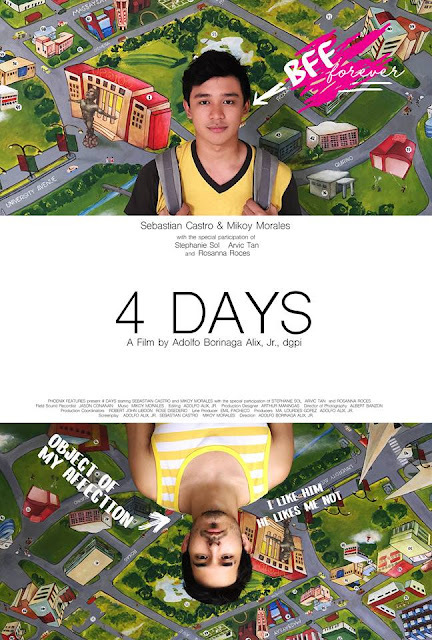 4 Days tells the story of two college friends who slowly realize they mean more to each other than either of them had initially realized. The film joins Derek and Mark in the days leading up to Valentine’s Day over the course of a few years- charting the blossoming of a friendship into something much more enduring as time goes on - and challenging both to question who they thought they were and who they truly want to me. Painting a moving picture of how an abiding friendship can sometimes lead to love - and how we sometimes have to wrestle with our own demons to find their true self, 4 Days is achingly romantic and delicate. Watch 4 Days as it opens in the following SM cinemas this February 9 at SM Mall of Asia, SM Megamall, SM North Edsa, SM Fairview, SM Southmall, SM Bacoor, SM Sta. Mesa, and SM Manila at 1:00pm, 3:30pm, 6:00pm and 8:30pm.